Highly productive tropical forests often occur on nutrient-poor soils . The apparent lack of a relationship between tree growth and site fertility has generated decades of research into which nutrients, if any, limit tropical forest productivity. This chapter looks at the lessons we have learned from several decades of fertilization experiments, which investigate nutrient limitation by measuring changes in growth and productivity in response to the addition of specific nutrients. 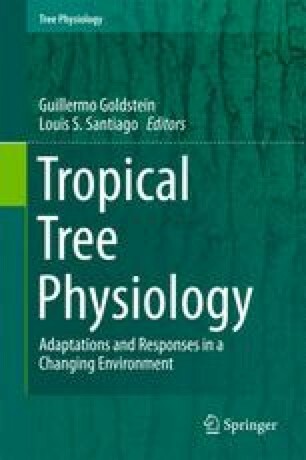 The enormous diversity of tropical forest ecosystems often confounds attempts to measure a clear ecosystem response to fertilization because tree species’ nutrient requirements differ according to life history strategy , adaptation to site fertility, and the life stage of the individuals under study. Importantly, other limiting resources, such as light and water, constrain individual responses to nutrient availability, whereas species interactions such as competition, herbivory , and symbioses can mask growth responses to nutrient amendments. Finally, fertilization changes the timing and balance of nutrient inputs to the forest, whereas litter manipulation studies demonstrate that the combined addition of many different nutrients and organic carbon minimizes nutrient losses. Most fertilization studies have investigated responses to nitrogen and phosphorus additions but there is still no general consensus on nutrient limitation in tropical forests. Future experiments will need to evaluate how the balance of multiple macro- and micronutrients affects tropical forest growth and ecosystem dynamics.